Teletext pages flashing all the time in some channels. Could it be that program tries to use teletext based subtitles when channel is actually using DVB-subtitles. Problem came yesterday after 3.1.14 update. Can you capture 60s sample from your hdhomerun and email to [email protected]. Please also try the beta testflight build in your email inbox and let me know if it has the same issue. Tested beta 4.19.2239 a while no more telextext “flashing” around. And DVB-substitles seems to be working. Cool. Is it using new style/font of subtitle or same as before? (resolution of bitmap text is a little bit low for HD). I guess that you cannot influence much of quality of DVB bitmap subtitles. You could change color, but white is fine. BUT when there is NO DVB-subtitles in channel Channels tries to use Teletext-subtitles. And case of channels like YLE-TV1 it uses actually YLE-TV2 teletext-subtitles… which is disturbing. Only way is to turn-off “closed captioning” when program has not DVB-subtitles. This problem is still in lates BETA… (few hours ago). Yuck. I will try to fix this bug. You should be able to “swipe down” inside the player to make the menu show, then “swipe up” and “swipe right” to switch tabs. Any news when this teletext issue will be fixed? Would be nice to have an option to disable teletext, at least here in Finland. Sorry for the delay here. I’ve sent you both a TestFlight invite for latest beta v9.13.53. 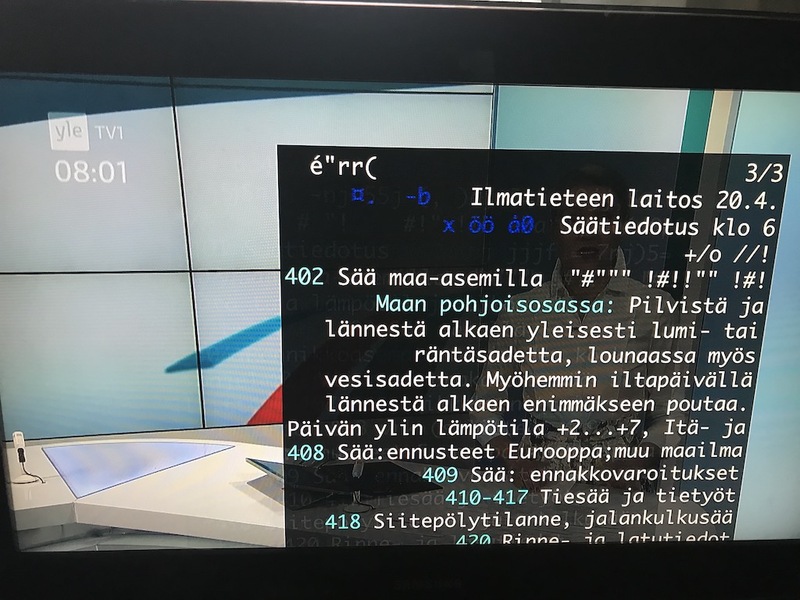 It should have the fix to stop showing teletext in Finland. Please try it out and let me know if it works. Yes, after some testing on 9.13.53 it seems like teletext issue is now fixed. Great job! Has been testing v9.13.53 for few days. Seems much better now. good. DVB-subtitles are getting rights so far. No extra teletext stuff showing. Whole teletext/dvb-subs situation can be quite compicated (in Finland). If program is in other language. There is dvb-subtitles in finnish. There can be dvb-subs in swedish. There can be teletext subs. By the way… if you choose in ‘YLE TV1 HD’ (teletext) subtitles from programs language menu, you get ’ YLE TV2 HD’ teletext subs. It would be nice to see types of subtitles in ‘Language’ context menu. Anyway… current beta works pretty well. DVB-info in DNA Helsinki cable network: http://dvb.welho.fi/cable.php (probably that you know this already).